Fireworks in the evening were anticipated by some stunning visual material at the John Rylands Research Institute in the afternoon. The fifth of November saw a group of ‘conspirators’ assemble in the Christie Room for the opening event in a new series. The research showcase will introduce the wealth of projects that are already being undertaken at the new John Rylands Research Institute. 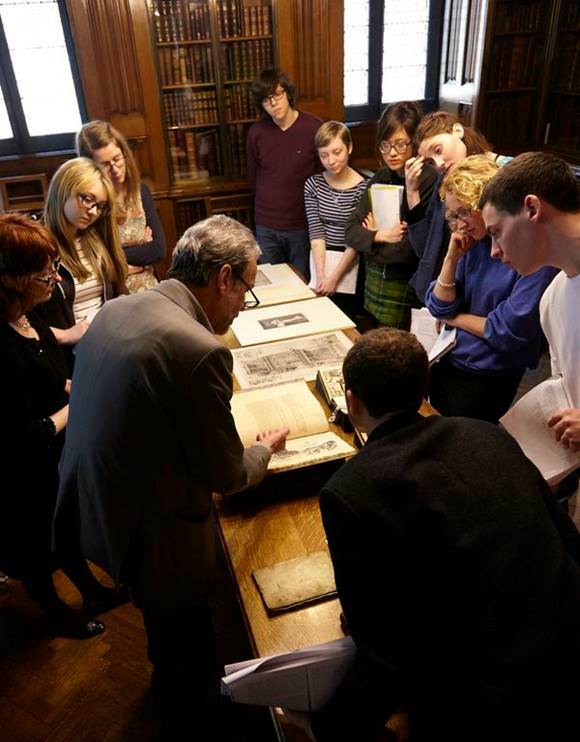 It aims to introduce The John Rylands Research Institute’s world-class resources and researcher support to scholars working in disciplines from medieval studies to avant-garde literature, from papyrology to photography. The format of several brief (10-minute) presentations from researchers (including Institute and Library staff) gives insight to a variety of approaches and resources on the topics covered by each seminar. 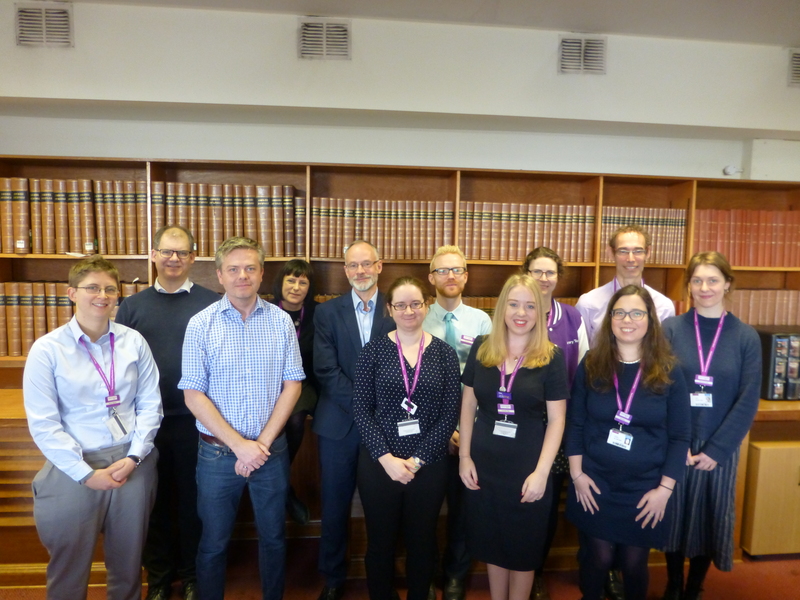 “The Rylands” is far more than just a library, and I’m particularly delighted that this first seminar showcased how The John Rylands Research Institute is enabling research into The John Rylands Library’s museum-quality visual collections. I hope the series excites researchers about how they can engage with the Institute’s activities and collections – especially those who wouldn’t necessarily turn to a library to look for primary material in the first instance. MS lat. 18 – and that’s just the half of it! MS Latin 18, dubbed by M.R. James ‘The Tree of Salvation’ in his catalogue of the Rylands Latin Manuscript Collection (1921), is a parchment roll dating from the late 14th century. 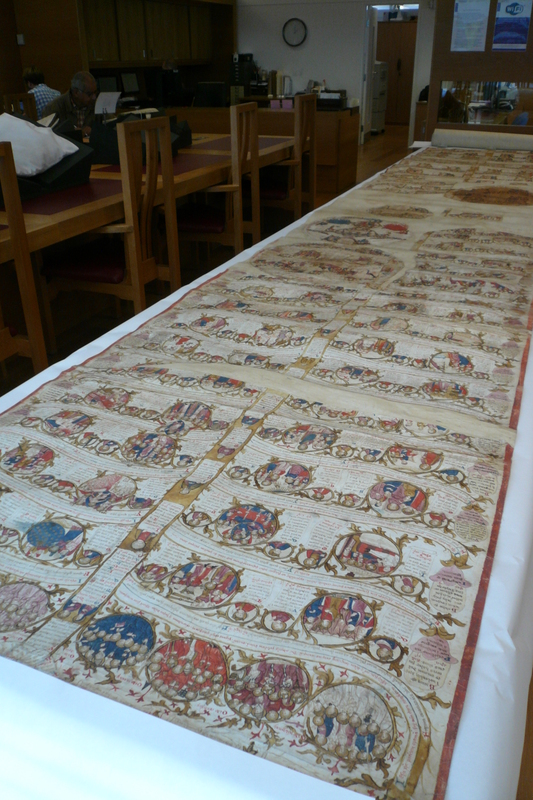 It’s a particularly large item, measuring nearly 640cm long and 85cm wide, despite existing in a partial state of preservation. It consists of a diagram of a tree decorated with biblical quotations and scenes. During my time as a research associate I’m hoping to assess both the visual and textual content of it, with a particular focus on three areas: I’m interested in the relationship of the form of the roll to its function, the visual and linguistic application of the metaphor of the tree throughout, and how it was used as a prayer or meditational device. Limited blog space doesn’t allow me to do justice to another very large item, a Mariette album of prints by Marcantonio Raimondi for the Earl of Spencer, unseen for a century but found and enthusiastically described by Dr Edward Wouk, lecturer in Art History ; or indeed the overview of the surprisingly rich and broad visual collections, notably the vast photographic collections (including equipment) and ‘evocative objects’, given by Visual Collections & Academic Engagement Manager Stella Halkyard.